No matter where jewels are worn: on your tongue, in your ears, or around the neck of your favorite pet, they are still pretty and valuable. The players are buyers and sellers of these beautiful items. On your turn, you put new jewels in your shop window for all to see. You put the most precious items in your safe until you can sell them (only in groups of four) and buy from shop windows when the right items are there. 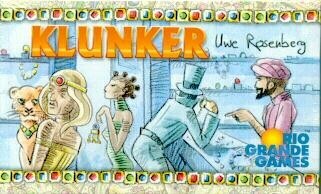 Klunker is an exciting card game for the whole family. The winner will be the player who best manages his purchases.